Happy Manicure Monday everyone! Today I wanted to share a polish in preparation for Fall: Urban Decay nail color in Vice. 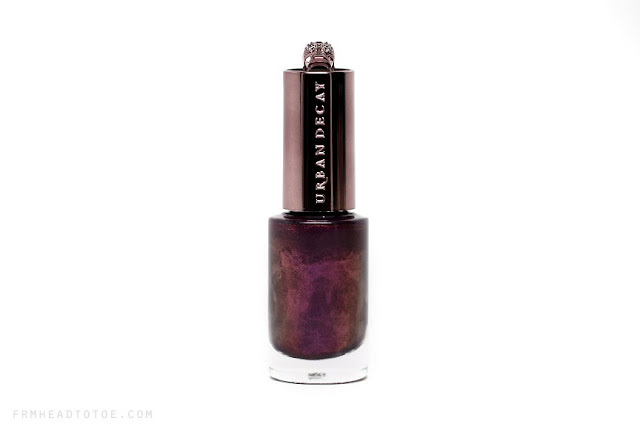 If you know anything about Urban Decay's history you'll know that nail polish was one of the original core products to the line and UD has never shied away from bringing bold, edgy colors to the table. Because of this (and of course the very cool packaging) I was super excited to try out this first of two shades from their Fall collection. Vice is a deep, shimmery amethyst that is blackened at the edges. It's dark enough that it's easy to pair with a variety of outfits but not so dark it doesn't clearly show as being purple. Here I used a base of OPI Nail Envy, 2 coats of Urban Decay Vice, and Seche Vite as a top coat. Although this easily covered in 2 coats, the formula was not very "self-leveling" and it was a bit tricky to get a perfectly even coat. I even took the extra steps of wrapping the tips (applying polish to nail's free edge) and using top coat, but still I began to see tip wear within a day. The next time I wear this I will probably use 2 coats of my base to even out the ridges on my nails which show through with this polish. As you can see, the polish in the bottle looks really stunning with the promise of some special duo-chrome action in reds, oranges, and lime green but disappointingly none of that showed up on the nails. This isn't necessarily uncommon to see, but I'd still have loved for that fire to show through after application. In true Urban Decay fashion, the packaging is totally rockstar with a skull on top of the handle and brand name debossed on the side. All in all, a cool product but not necessarily unique as far as polishes go. If interested, you can pick this up for $15 at Sephora, Macy's, and beauty.com. Readers, are you a fan of purple polish? What Fall colors are you looking forward to wearing on your nails? Let me know in the comments! Such a luscious shade. Looks beautiful, checking it out soonish. WOW, such a lush vampy colour, Jen! Such a cool and awesome colour for fall and winter! Great colour for this season! Love the packaging and the shade! Too bad it didn't meet your expectations. I do love purple polish for my nails, such as China Glaze Blurple Purple or Let's Groove, or Zoya Mimi. Like the color, too bad it doesn't show the shimmer. I really like the San Francisco collection by OPI. Muir Muir on the wall and in the cable car pool lane are my favs, peace and love was a bit disapointing because the swatch on the Ulta ad and the actual color were totally different. Though it seems to be a lot of work, that purple color looks sick, like what I imagine a dark venom to look like. I'm loving dark purples for fall and greens too, and any jewel tones for that matter. If anyone knows of a dupe that has a better forumula/price, let me know! Beautifull colour. Also love the nail polish's recipient! Very stylish! Great blog, greetings from Spain :). Beautiful shade.... & lovely blog.